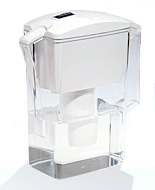 The Brita Space Saver water filter pitcher is slim enough to fit in your refrigerator door, but it has the same 1.5-quart capacity of Brita’s traditional styles. It’s a convenient size for crowded counters and refrigerators, college dorms and vacation homes. This Brita Model 42364 water pitcher with filter and covered pour spout is available with our low-price guarantee at Today’s Concept. Your BPA-free Brita pitcher will filter out the sour taste and sharp odor of chlorine while reducing the levels of unhealthy metals that can find their way into your tap water. The 48-ounce Space Saver comes with a calendar minder to let you know when to change your filter.